THE CHURCH IS A GROUP OF ANY BELIEVERS--AS FEW AS 2 OR 3. THE CHURCH IS MEANT TO WORK TOGETHER AS BROTHERS AND SISTERS, ON A COMMON LEVEL--TO CARRY ON CHRIST'S MISSION--TO CARRY THE GOSPEL OF SALVATION, HEALING, DELIVERANCE AND RELEASE--OUT TO THE WORLD--TO THOSE IN NEED. THE CHURCH IS MEANT TO OPERATE BY APOSTLESHIP, SMALL GROUPS OF BELIEVERS WHICH MEET TOGETHER FREQUENTLY. THE HOME OF EVERY CHRISTIAN IS THE "PILLAR AND GROUND OF TRUTH" FROM WHICH THE CHURCH IS MEANT TO OPERATE. Christ the Head........x502.....The Bible states without reservation that Christ is the Head--with all power and authority--over the church. The word also tells us plainly that ministry is NOT authority over one another--but service--as demonstrated to us by Jesus Himself in His ministry. We cannot serve two masters--only Christ is the "head of the corner"--and we are not to call one another master--only Christ is our master. All this fits into the church operation in the Bible--but it does not fit into the operation of our church of man's tradition?. Wanting Luke 4:18........x457.....I believe that most Christians today are very very close to what God wants. We all want to see people get saved. We want to see people get healed--and be delivered from the snare of the devil. We all want to see the poor fed and clothed. Most of us realize that God inside of us desires these things--and most of us live for the times when God works through us to reach out to the lost and the sick and the needy. But perhaps we are missing one final step in the ministry of Christ and the fullness of what God wants. Do we really desire to see others freely released to serve God and minister? Do we really want to see the whole church in ministry? Do were really want the apostolic method--the picture painted for us in the book of Acts?. What would it look like--.........x481......What would it look like if we all suddenly began to operate the church just like it was operated in the Bible? The answer is that we all would be free--that we work together freely--as the Spirit lead. And the plain fact is that it would be easier than trying to operate the Roman chruch which we strive so hard to build! It would be simple--direct--inexpensive--yet very effective to do what God wants--which is--to get people saved--healed--delivered--fed and released!! Luke 4:18--Jesus/church--all the same ministry!.........x480.......In this important verse of Bible, Jesus outlines His ministry. He names 5 aspects to it: the Gospel, healing , deliverance, releasing apostles, and feeding the poor. Literally everything that Jesus did in the Gospels can be categorized under one of these 5 headings. But, exactly the same statement can be said of the church in the Bible. They simply and effectively carried on Jesus' ministry by continuing His apostolic method. This is how Jesus worked, and the church in the bible worked the same way--does your church operate this way?. New Testament church functioning--We haven't forsaken the assembly--we've forsaken the house!....x257......The house of every Christian is supposed to be the house of God--the operational place for the church. What if we really did things this way? What if we had houses that fed the poor and witnessed the Gospel to the lost--and prayed for the sick and brought deliverance to those in need? What if?? What makes up the body of Christ?.....x370......The description of the new covenant church is as a body, made up of varying parts, each of which has a function, which falls under the categories described--Some, apostles; and some, prophets; and some, evangelists; and some, pastors and teachers;". Study on hebrews--"Assembling Together" Explained in context!-- X539........."Forsake not the assembling of yourselves together" What does this mean? Most think it means "meet together, on Sunday, under the authority of the pastor--make your offering--and be quiet most of the time in church." Study Hebrews chapters 7-10 for yourself--read this verse IN CONTEXT! The Bible tells us exactly what "asembling should and should NOT be about. speaking the truth in love.........x307........The areas of the Bible which speak of new covenant ministry gifts are always attached to the love of God in a big way. Read these verses in the context that God set them in. You will see that there is no way that ministry is authority over others--it is the way that God will operate through all of us together--the way for us to be glorious in Him--the way for us to speak the truth--but the truth in love. The promise of God is that if we will strive toward His glory--and freely encourage one another to these ministries--the love of God will be poured out into the earth--what an incredible promise!!. X0605.......The Purpose of the Church: The Gospel..........Philipians 1:27 says that the purpose of the church is to stand "side-by-side" and share the Gospel together. Does your church really do that? Do you minister together as equals in the Lord? The NT Church--A church which was carrying on Jesus' ministry.........x474......Jesus' ministry had 5 parts. They are outlined in Luke 4:18--they are the preaching of the Gospel, the feeding of the poor, healing the sick, deliverance from the enemy, and the making of apostles. The 5 gifts of ministry are simply the anointings which Christians have been freely given to operate Jesus' ministry. The example of the church from he Bible was simply a group of people--doing exactly what Jesus did--doing Luke 4:18. We have a different church system and other goals which have been given to us by tradition, which divert the full effectiveness of Christ within every member of the body. X04.02......Experience--Our Greatest Enemy!.........Here is a simple concept that we should all understand.....Ministry, is God, working through someone to serve the needs of others. Would you agree with this? Of course! Now, God is in all believers.....right? Therefore, ministry is for all believers. You may beleive that I have made up my own doctrine by these conclusions--but they are absolutely in the Bible--IN CONTEXT. Where? Ephesians chapter 4--somebody read the BIBLE!! X04.03.......Laying on of the Hands of the presbytery--sounds impressive! !............The authoritarian tradition of the church makes us translate the Bible in certain ways. We "read" our ideas of "church " and "ministry" into the Bible--and this can make us look at things from a wrong perspective. We believe that ministry is a rarity--but in fact the Bible describes a quick release to ministry--and the passing on of ministry gifts--something called "release"--have you ever heard of it? Just Exactly Who is "sent"/Someone had to be an apostle.......x304.....What is an apostle? Is it a saint of old which we don't need in our modern day and age in the "pastoral" church? Did you know that it was Jesus fervent prayer for all of us to be apostles? And that the Bible says that people will not be saved unless someone does the work of an apostle? You are an apostle and you don't know it! Hebrews 10---No more offering--no more tithe........x439........In the book of Hebrews, chapter 10, the word of God states that there is no more need for an offering for sin. Well, we all understand this--we all understand that it is the blood of Jesus which makes continual offering for all our sins. But do we realize that the offering which was eliminated from the Old Covenant--was the tithe? 1/10 of Israel's grain and herd was considered Holy unto God--and made as the offering for sin. Jesus called Himself meat--and bread--offered freely to all to partake of Him (this means we are all priests--since only the priests of Israel could partake of the meat and grain of the sacrifice--therefore all are ministers unto God). Jesus offering for sin eliminates the need for more offering--therefore no more tithe. 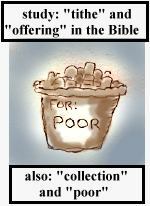 X04.01............Not Tithes and Offerings--Distributions and Collections..........The New covenant church did not have "tithes and offerings"--Jesus did away with these at the cross. Instead they were Spirit-lead in their giving, with collections for the poor, and distribution to "every man" who had need. How is it when you come together?...........x206.........In 1Corinthians, God gives us commands about how to operate whenever we are together. Are we obedient to these simple commands? Maybe we should review the manual before proceeding with another church service! How It Works/Division is the Key........x205.....The operational principle of the New Covenant church in the Bible was very simple, direct, humble, yet miraculously powerful and quick. This is is simple outline of the way to operate the church Biblically. Proved and tested and tried..........x515...........In order to be a "minister" you must first be tested and proved and tried---right?? Well, exactly what are the "tests and proofs" and who has the right to test and prove an try you?? The "pastor"? If we used the tests in the Bible, probably about 80% of Christians would be qualified as ministry (yes--"5-fold" ministers! !--apostles, prophets, evangelists, teachers--and yes--pastors!!). The church would then become a place of function--on a common level--as true brothers and sisters. Bottom line: Christ within all of us would be able to carry on His purposes through all of us--in other words more people would get saved--healed--delivered--fed--and set free to minister to the Lord. In other words we would have an uncontained revival that would sweep the planet! Or--we can continue to sit in church every week, and wait for the glorious day when the pastor finally notices that we have a gift--a day which more than likely will never come. 2 Houses of God.......x111.....In the Old Covenant the House of God was the temple in Jerusalem. It had clear specific purposes for Israel. In the New Covenant, the House of God was the home of every Christian--a clear specific change between the covenants. Hierarchy--only in the OT.....x527........We think that in the new covenant, God ordained "offices" of ministry. We use this idea as the basis of much of our church operation. It's wrong! It simply is not in the Bible--it is not in the Greek!! The word "office" (Greek: "hierateia") is used only to describe the old covenant Levitcal priesthood, not the new covenant ministry gifts. 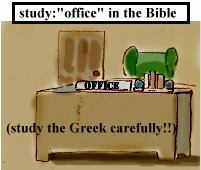 The word "office" was inserted by the experience of translators of the dark ages--to satisfy the church system of Christian kings (rulers who exercised absolute authority over their subjects--no wonder the Bible is filled with these type of words!!). 2 Corinthians 9--all about giving in the NT.......x534.........This area of scripture talks to the new covenant Christian church in the area of giving. Only one thing is out of place--NO TITHE!! Open your Bibles and your hearts and honestly study all that the Bible says about the tithe. Read it all--in the context that God set it in. The tithe was the amount Israel had to pay the high priest of Jerusalem, as an offering for sin. All the giving in the new covenant church was toward the poor--for the needs of any who ministered--not just to the "leadership". Open your Bibles and your hearts and honestly study all that the Bible says about the tithe. Church In the House.........x151.......The "House of God" in the Old Covenant was the temple in Jerusalem. The "House of God" in the new covenant is the home of every believer--it is the indwelling of the Spirit within people--NOT a church building. This Bible study relates all the New Testament scriptures which refer to the House of God. Unity Based On Commonness............x436........The church described in the Bible had a unity based on commonness. they operated the church on a common level--specifically, ministry was NOT authority one over another. they had "one accord". this is not our idea of uniformity (file into church--file out--keep quiet)--this is described in the Bible as a rushing wave of God's power--in all the people. Does your church operate in this way? The Proof of a deacon..........x161........Are there requirements for someone to be a minister? The Bible gives the requirements in 1Timothy 3:1-16. Tradition reads these out of context and limits ministry--why shouldn't we allow everyone who qualifies by the Bible standards to serve God? Feeding the Poor which are Our Brothers........x492...............WE have a concept of giving within the church that usually goes something like this: We all give our money to the leadership--and God leads them to use it for His purposes. Is this Biblically correct? The simple answer is no--at least if we look at the new testament. In the old testament, there was the need for a Levitcal priesthood--a group of specially chosen ministers--who operated in the temple--with the purpose of taking the tithes (the 1/10th Holy offering of Israel) and making sin offering to God for Israel's sin. The new covenant specifically annuls the Levitcal priesthood (see Hebrews ch 5-10)--and the need for this type of offering. So, how did the new covenant church give? The plain answer was that they gave to the poor within the church. The offering and collection of money was for "the saints" NOT for the leadership. It was Spirit-lead--not lead by the law of the tithe--and it was direct to the needs of the poor within he church. In fact, Jesus says we will be judged on this specific point!. X04.20..........Ten Thousand Teachers---Zero Apostles! !..........The Corinthian church was scolded by Paul for having too many teachers--and so getting away from the purpose of the Gospel and the operational plan of apostleship that he (and Jesus) had demonstrated. Could you church take this advice too? X04.22.............What TO DO With Your Money...........Give to the poor. Let the Lord lead you. Use your resources to directly further the Gospel in every way you can. Don't give to yourself! Good Works---Beautiful energy........x491.....Good works are for all of us to do. Now, the Bible says we are not saved by our works "of the law". These good works are not our obedience to God's law--what the Bible means when it speaks of good works--is ministry--serving God by operating in His purposes (see Luke 4:18)--spreading the Gospel--praying for healing and deliverance--feeding the poor--and releasing others to freely serve God (apostleship). Our energy is meant to serve God--not earthly things--not money--we all are called to serve God--which means we all have a ministry to fulfill. Jesus was taught of the Father and sent too!.......x40.........The apostolic ministry of Jesus is clear in he Bible. He was sent (Greek: apostello) of the Father--instructed of the Father--to lay down His life (ministry)--and to heal save and deliver those who met Him with faith--but also to "send" them. Jesus certainly made apostles--but His apostolic instructions are for His followers (including us!) to also send one anther--to release one another--to set one another at liberty--to freely serve God. Jesus was an apostle of the Father--he made His own apostles--and all those who believe in Him through the word of those apostles--are to be apostles too!!. Hit the Streets--With Your Anointing!.........x201...........The word of God in the book of Romans chapter 10 tells us how to be saved--but it goes on to ask how shall they call on Him whom they have not heard--and how shall they hear without someone speaking to them---but the final question is: How shall they preach , except they be "sent" (Greek: apostello). the Bible tells us that apostolic ministry is essential to the kingdom of God--essential to getting people saved--so why do we not operate the church by apostolic ministry, as the church of the Bible did?. Division is really God's multiplication!.......x19.......Jesus' first concern in His ministry was to find apostles--people who would do the same stuff that He did. Jesus literally divided Himself into 12--He understood that Godly principle of dividing and releasing. Have we invited spirits into our church system which work against this plan of God? Teaching--what We Lack.........x463.......Very powerful tradition in the Christian church says that most Christians need weekly teaching--which comes from one man--for their entire lives. The teaching of one man is the central focus of "church"--and occupies a large part of what Chrstians do when they are gathered together. We would challenge you to study what the Bible says about teaching--who can do it--how it should work in he church. The answer is that teaching ought to be simple direct and Spirit lead through any individual--and NOT from one single man--over and over and over again!. 2Cor 3 Says there are 2 types of ministry--OT and NT.......x447.......What's the difference if we get our church plan and operational system from the old covenant or the new? After all it is all God's word--right? Many preachers often teach about the Bible being "all God's word"--which is certainly true--however, shouldn't we set the entire Bible in the context and order which God set it in? If God made changes from old to new--shouldn't we operate by the new changes? whether we realize it or not, the new testament calls the old testament ministry--the "ministration of death"--and states that it ought to pass away! Psalm 68:18--the establishing verse for ministry--Does anybody know this?.....x280..Our quiz question for every pastor and minister: What is the Old testament verse which establishes the "5-fold ministry" of the new testament? Answer: whether anyone knows it or not--whether anyone likes it or not--it is psalm 68:18. An incredibly little known or studied verse, which states rather clearly that these gifts of ministry are given to humanity--to every one--even the rebellious! Do we know this at all? Has anyone ever studied this at all?. added to the church by being the church.....x114.........The Bible does not tell us to "go " to church--it tells us to "be" the church. In the book of Acts people were all serving the will of God in commonness and unity and love---isn't this the high calling of God?. The "hidden" apostolic command.......x330......When we read the Bible as it is most often translated, it seems as if there were only a handful of special people who were named out as apostles. this could lead us to believe that only "some " people are really called to ministry--or even worse that the apostolic age has ended. The truth is that the traditional way of translating the Bible is to leave the word "apostollos" untranslated--and to translate the Greek apostello as the word "sent"--in English they look like two different words--yet they are really speaking the same meaning. this Bible study translates some of the hundreds of uses of the word "apostello"--from which we will find that it is used many many times--and in fact we are all to be "set at liberty" as Christians--to freely serve God. Jesus Is My Tithe........x200801..........Jesus called Himself everything that was "tithed". He said He was blood and meat and bread and oil and wine--all the stuff that Israel had to offer for sin. So, why should "tithe" be a money-plan for the Christian church? Malachi, Prophet of Jesus.........x200803.........Poor Malachi! For centuries Christians have taken his prophetic book and made it into a money law! When Malachi was talking about rebuking the devourer, and pouring out blessings, He was prophecying about the blood of Jesus. WE Pay--Do They Obey?.....x367............The church in the Bible gave all of their money to the poor within the church--for any one who had lack. the leaders did not receive a tithe, nor did they use the money that they distributed for their own welfare. or just for their own ministry. They did not use the money to build a large building--the collecting of money was "for the saints" for all---not to pay the leadership who was the "full-time ministry". Pastors instead of Apostles....x373.......We have many many pastors in Christianity today.we operate the church by pastoral authority--something which cannot be found in the Bible--and is Biblically defended by the vaguest of scriptures. On the other hand, the word of God is filled with apostolic ministry. Our sad situation is that we have a misdefined concept of pastoral ministry, and totally ignore apostleship--one of Christ's greatest gifts!. They Broke Bread together........x342............The church after the day of Pentecost is described as having "fellowship" and "breaking bread together". When we read this things we lay on our concepts which come from tradition. We think this means they had social fellowship dinners together--and that they celebrated a ritualistic re-enacting of the Lord's supper. Wrong! Study the Greek meanings of these words and come to the understanding that they were actively serving God in these activities. Their fellowship was ministry, and their breaking of bread was a time to plan the activities that God wanted them to accomplish on a daily basis--what a great way to operate the church! Who Can Be a Prophet?.......x374.....In the Old covenant, only certain special anointed people were chosen of God to be prophets. However, there is a clear and radical change about prophecy in the New Covenant. "Sons and daughters" may prophecy--and the church in the bible operated by this principle--they understood the vital importance of the prophetic gift in every born-again Spirit-filled Christian. the prophetic gift gave the operational instructions from God. There are mighty promises of God in the Bible if "all prophecy"---why don't we strive to this high calling of God? No Accountability In Leadership With Regard To Money!.........x410........... "The money was laid down at the apostles feet". This quote is often taken out of context and used to teach that the giving of Christian money is meant to be to the leadership of the church. Can we read the rest of the verse please? "distribution was made to any man as he had need"--the truth is that the giving of money in the New Covenant was to the poor, to those who had need--100%. This is the root of the evil which stops the ministry gifts from being the operation of the entire body of Christ--and not just for "some"
X0629..............I Dont' Go To Church Any More...........More and more people are not going to church, but calling themselves Christians. Are they all "wicked evil church-hoppers"? Maybe they are people who are being lead by God. Maybe they have realize that they should not GO to church, but BE the church. Jesus Mission Statement........x426........In Luke 4:18, Jesus describes His ministry in one verse. He clearly states that one of His purposes is apostleship--the "setting at liberty" of those who accept Him by faith as Messiah. Apostleship is a gift--just like salvation--it comes from Christ Himself. He desires to operate His ministry through the entire church. X0614..........Don't follow the old covenant ideas..........Hebrews chapter 3 tells us plainly that we should not follow certain specific old covenant practices. Are we listening? Are we truly following the new covenant? Jesus description of a good pastor--John 9-10........x233.......There is only one place in the Bible which deals with pastoral ministry definitively. If we study it carefully, and in context, we will find that Jesus in these chapters, makes an apostle, and calls this release to ministry a good pastoral work. X0610...........What Really Went on In the Upper Room ............Christians have been so brainwashed by the repetitive nature of their meetings, that they see it in the bible where it really is not! The upper room was about the Gospel, not a "church service". X0611............Why The New Testament Church Did Not Pay tithes and make offerings.......They did not do this because Jesus was their offering. "Offering" Biblically, means to make a due payment for sin. "Tithe" was the amount of the sin offering. Read the Bible for yourself and see. Hebrews 7-10---the offering done away with!........x438.........This is a detailed study of these 4 chapters of the book of Hebrews. These chapters tell us plainly, that in the New Covenant--there is no more offering for sin--we have a greater priest--we are all to be priests under this new high priest (Jesus). He has made the one time offering--the one time tithe--for sin. There is no more need of offering of animals and grain--which was what the tithe consisted of. WE Get the Blood---But What About the bread and Meat?........x508.........Most Christians understand about the blood of our Savior Jesus. We understand that He shed his precious blood for the forgiveness of all our sin--it is the blood which saves us and heals us ("with His stripes we are healed"). But--do we understand that Jesus also called Himself bread and meat? Do we understand the significance of the offering of Himself--His body--as bread and meat? We celebrate the Lord's supper--and know that "all are called to the table"--but do we realize that the bread and the meat are the release that Christ brings--for all--to ministry?!! Sabbath purpose..........x513.........The purpose of the sabbath day, according to the Bible, was for sanctification. The sabbath was for "getting your sin cleansed"--a day when most of Israel could not work--except for the Levites--the priests of the temple--who did their work of carrying on the activities of making blood offerings etc. which had the purpose of sanctifying--but only for a time. The rituals of the sabbath had to be repeated over and over again--since the "blood of bulls and goats" can only cleanse the flesh temporarily--But we are new covenant believers--right? We have the blood of Jesus Christ--which is meant to "purge your conscience from dead works to serve the living God". Question to the 21st century Christian church---why the endless repetition of a sabbath ritual?. John 6--the whole chapter........x523.......Study with us this chapter of the word of God. We will see the message and action of release that Jesus brought into the world. Release was a central part of Jesus' ministry--He "sent away" all the people--He released everyone who believed. Question: Isn't "Jesus Christ the same, yesterday, today and forever?". Question #2--where is the release in our churches today??. Acts 20----Give To The Weaker! !.........x533..........The Bible instructs us to give to the weaker among us. The church--as the Bible describes it, is a body of individuals--all who are unique--yet all have a function. Our tradition tells us that we should give to the strongest member--to the "person in authority"--exactly the opposite of what the Bible asks us to do. The question we humbly ask is this: what if--we gave to the poor within our churches? The Bible says we would be glorious if all ministered --and if all had the support needed to operate in ministry. What if?. 1Thessalonians study//LKAR......x535........Read through his short book of the Bible and take notice of the nature and operation of the ministry described. The cooperation on a common level--the apostolic operation of brothers in the Lord. Compare it with our idea of pastoral authority and church format. Again as always we simply ask you to study these things for yourself!. A list of people that Paul worked with (fellow soldiers--apostles)......x520......Historians and theologians often line up with the common tradition that Paul was somehow a "one-man" ministry show who went out and got the whole world saved--all by himself. Some will admit that he did always work with others--but they still believe that he was the "great leader" of the early church. The bible truth is that Paul was simply the guy who had the job of writing the letters to the churches, after he and his fellow apostles had brought the Gospel to an area. They all worked together--as equals--each doing the part that the Leader commanded. Oh, and who was the Leader? Simple; Christ the Head of the church--speaking to His people, through the leading of the Holy Ghost. God as the Leader----what a concept!!. All uses of the word diatithemi........x101.......Jesus only uses this particular Greek word one time--in Luke chapter 22--the place where He makes the definitive statement that authority one over another is NOT what New Covenant church ministry is supposed to be. The concept of servant ministry is the central operating principle of the New Covenant. The "Collection"--For the Saints! !.......x106.........In the New Testament Bible church, 100% of the money which was collected was for the poor within the church and NOT for the leadership of the church or the operation of a church building. 1Peter 5--who's "subject" to who?.....x107.......The rules of church authority according to the Bible are that we all cooperate with one another on a common level. 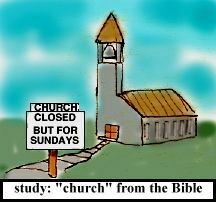 In the Bible church submission was a 2-way street--not 1-way authority as in worldly government. X0626.........."Apostles"---How God gets people saved..........God, in the Bible, operated through apostles. The actions of apostles were the actions that got people saved. We think that god still works the same way, and the church ought to recognize this and do our best to follow this example. church is not a building and office is not a room!.......x153........Tradition has handed us certain concepts which are simply not Biblical--yet we still translate the Bible by our experience. When we read about "the church at Ephesus" do we think of a building with stained-glass windows--or do we realize that the church is truly and always people and NOT a place?. Fit Your church Into the New Testament church.......x176........The Bible describes a church which operated in a 7-day-a-week revival amongst all the people--in the homes of all the people. Does your church fit in with the Bible example of the church? Disciple to apostles--and back again!........x18.......Ministry is a function--a gift--an anointing--NOT a title of rulership over others. When the followers of Jesus were being taught by Him they were called disciples (students)--when He sent them out to carry His ministry to others, they were called apostles (those who are sent). Ministry is a function! Colossians 2--Jesus spoiled the authority........x498............This area of scripture says that Jesus openly spoiled a certain authority. We have often been taught that this is referring to Satan--but if we read this in context--and in context with the rest of scripture--we see that the authority that was spoiled openly by Jesus was in fact the old covenant authority of the Pharisees and priests. Jesus is to be the Head of the church--not a group of tithe-collecting priests or Pharisees who rule with authority over others! Jesus Spoke destruction to the Temple--Why do we still rebuild it?........x484.......Jesus spoke against the temple--He spoke against the ruling Pharisees--and the new covenant clearly says that the levitcal priesthood is not necessary since Christ is our high priest and we are all now made priests directly unto God. Yet, we continue to get operational plans for the church from the book of Haggai--we search the Bible to find what we want it to say!!. Jesus Saves---Jesus Heals---Jesus Delivers---Jesus RELEASES!.......x482.......In the Bible this is what Jesus did. This is also how the church in the Bible operated. They understood clearly hat He was alive in them--and would and could operate His ministry through them as a group (this is what apostleship was all about!) But history shows us that all the parts of Jesus' ministry were stolen--claimed to be under the authority of the church organization--under the authority of the earthly leaders of the church. Hundreds of years ago, Jesus was left out of the picture completely. but history tells us a wonderful story--God has been restoring the ministry of Jesus, back into all His church--!!. Principalities and powers.......x467........Principalities and powers are the words the Bible uses to describe ruling authorities. This study looks at every verse which refers to ruling authorities. The bible tells us that authority is found in 3 places--heaven (Gods' authority) hell (Satans authority) and the earth. The first two are obvious--however, the authority in the earth, is clearly only to be found in man's worldly governments--and NOT in the church. There is no "church principality"--there is biblically no "pastoral authority". The church in the earth is not meant to be a physical kingdom ruled by man. Christ is the Head of the church--Christ with ALL authority and power. What Have I got Against Tithing?......x454.......Answer: it limits ministry. When we operate the church by the tithe, we are singling out the leadership as the "true ministry"--and ignoring and subverting the ministry which is meant to flow through all the church. Therefore we limit God--we ignore the poor which are among us--and the end result is that people go to hell, since we are not all working together to get them saved, the way we should be!. The apostolic plan for the church........x452A...........We operate our churches by the pastoral system--something which comes to us from tradition--(specifically from the Roman empire!). Here is a simple description of the apostolic plan which the Bible gives us for the church. worldly system and kingdom of heaven--w/regard to tithe........x449...........In the world, the person who can convince others to give them their money, rules with authority over others. This is the basis of a successful business plan. Money is the "bottom line"---the leader controls all of it, and commands it's uses in the company. Should we really have the same system in the holy church of God? Is this God's highest call for us as Christian brothers and sisters?. Yes, But Only Jesus Can make an Apostle.......x448.......Study the word "apostle" in the bible. Look up the word "sent" and you will find that in Greek it is "apostello". You will find that apostles are all over the new testament and central to the operation of Jesus' ministry as well as that of the church described in the Bible. Tradition tells us that the apostolic dispensation has ended--the apostles contained in the bible ought to be revered (perhaps worshiped!) --and looked at as distant examples. Tradition says we ought to build a pastoral church--something which has no real Biblical basis. What if we operated by the apostolic method described in the Bible?. the full discernment of Jesus........x25.......The story of the demoniac of the Gadarenes should teach us some important lessons. 1. Jesus, sees a demon possessed person--when we see someone in this state, we congratulate ourselves for our "discernment" and run the other way! 2. Jesus casts out the devil--some of the more adventuresome of us might leap to this level of faith--but--3. Jesus releases the formerly demon possessed man to serve God fully--He sees a minister--an anointing inside of the worse person--Do we do this? Do any of our church systems allow for the free and immediate release of people to ministry? Jesus did it--why not us?. Ministry--Born--Not Created......x252........Our church experience tells us that "ministry" is something that comes after many years of work in the church--after certain schooling and training. Do we really recognize the Bible fact that ministry is given unto every one of us--and that these people who serve God are what God wishes all His children to become? "The Son of Man is as a man who has gone on a journey, and given His authority to His servants and to every man his work" (Mark 13:34). One Body--Many Parts--Each has it's Own function.......x258.......We never study ministry from the Bible. Most of us think we know all about ministry--we are spectators of it every Sunday in church--right? Study ministry as a Bible doctrine--you will find that in every place where ministry is doctrinally defined, it is always prefaced by the concept of the church being a body--a group with many parts--each with it's own function. The function of each part of the body--is ministry! Tithe--Something You Ought To Do?..............It's very clear that tithe was a practice of old covenant Israel. So do we realize that we are teaching the new covenant and practicing the old? Tithe, Not A New Covenant Form of Giving.........God wants us to give--but He wants to direct the giving! We ought to be giving to the needs of the Gospel and not to ourselves. Paul sent Epaphroditus.......x272.........Tradition, which comes to us from past churches which worshiped saints, has prejudiced us toward the true actions of the people in the Bible. For example it is often thought that Paul was this incredible "one-man-show"--an exceptional, miracle working man who single-handedly spread the Gospel around the world. The fact is that Paul was an apostle--which automatically means that he always worked with other people. and in fact, in this instance, he says he sent Epaphroditus--a "fellowsoldier" (someone who functions under all the same apostolic authority that Paul had)--and in fact Paul calls Epaphroditus the apostle in his instance, and not himself. Proving once again hat ministry names are not titles but functions of people--and that ministry is common to all people--including apostleship. Paul said he had the power to lead other apostles......x281.........If we consider the Bible as our example of ministry, we will find that Paul says clearly said he has the authority from God to release other apostles. In fact, there are many places where this is said--it is plain that it was common practice--and in fact a common goal to release as many as possible to serve God fully. This was one of the central operational principles that Jesus had taught and demonstrated to His followers--and the church which followed operated in this fashion. So what's our excuse for not operating the church in free release of ministry?. God's System and the system we have (right now at least).......x29.........The system by which we operate our churches, to a large degree, is simply not God's pure idea of church operation which the Bible gives us. The real truth--which you will never hear in church--is that it would be much easier to operate the church by the rules that are stated in the Bible!!!. Romans 6:22--Become Servants.........x290.........This area of scripture tells us that before we were saved, we were servants of sin. But, after we are saved, we must serve God in order to obtain our sanctification--in order to truly fulfill all that God has planned for our lives. The Bible urges all of us to serve God--to be ministers to His will--can anyone disagree with the statement that we are all meant to fulfill our service to God in our lives? Then why do we not hear more teaching on this subject--and operate our Churches in a way which allows everyone to actively serve God? Jesus was taught by God the Father.......x30..........The pattern of the new covenant ministry was teaching with the purpose of release--discipleship which leads to apostleship. Jesus Himself said that he was taught by the Father--and sent (Greek: apostello) by the Father. Jesus operated His ministry by this same pattern--He taught and released--He turned disciples into apostles. And the same pattern is apparent in the church described in he Bible--Saul spends a few days at Damascus, and is released to serve God. What other pattern should there be for us? Them that have the rule--submit--or imitate?.......x314.........One of the greatest problems (which specifically limits ministry from operating through the entire body of Christ) we have in the church is undefined rule. the operation of our Churches is based to some large extent on a half-verse in the bible which seems to say that there is someone in the church who has "rule". We define "rule" as authority over others--as the world does. If we study this word Biblically, and in the context God set it in, we will find that "rule" is service--and we are all told to imitate this principle amongst ourselves. No one is ever specified in the Bible as "having the rule--that's because it is Christ who is supposed to have all authority and be the Head of the church!!. The preface to Ministry.........x334........Each time the Bible speaks of the gifts of ministry, they are prefaced by a description of the body of Christ--the church. ministry, when studied in context, is clearly described as being within the entire body of Christ--as the operational plan for the church--NOT as rulership titles or hierarchal authority. The Tithe Is Holy Unto the Lord/ /must be destroyed-- ..........x345..........when we preach tithing we are denying the ministry of the entire body of Christ. We are saying that we have certain people in the church who are in fact the Levites--the priests of the church. Only a priest collected a tithe in the Bible--it was his payment for serving God. Yet in the New Covenant, we are all made priests unto the Lord (Revelation 1:5-6). Jesus called Himself bread and meat, and invited all of us to eat. The Levites were the only people in the Old Covenant allowed to eat the bread and the meat of the sacrifice--they lived off the meat and grain of the tithe. We are all priests--all invited to eat of the sacrifice--all ministers unto the Lord. Purpose of the tithe//...... ....x346.......The purpose of the Old Covenant tithe was as the offering for sin. God needed blood to be shed, on a constant basis, in order to hold Israel's sin in forgiveness. It was therfore necessary for 1/10th of the herd of Israel to be made Holy--to made clean before God as sacrificial offering. The book of Hebrews speaks about the Levitical priesthood--declares it to be done away with in the the New Covenant--and then makes the clear statement that there is no more need for an offering in the New Covenant--we have the perfect, precious and pure blood of our Savior Jesus--amen! The Tithe Is Holy Unto The Lord.........x347............These words are often taken out of context, and taught to mean that 1/10th of your income is Holy unto God. If we dare to read these verses in context, we will see that Israel was told that 1/10th of their herd and their crop was considered "Holy" by God, and needed to be offered to forgive their sin. Next read about the better offering for sin which we have as New Covenant believers. The tithe limits our giving. in the New covenant there was no law of tithing. Giving was Spirit-lead--and to the poor within the church so that none had lack--what an easy, direct and blessing-filled system this would be--if only we would be obedient to teach it in our churches!. Tithing Is Of The Law.........x348.......The tithe was the Old Covenant offering for sin. In the New covenant we have a better offering, the blood of Jesus, which is better than the blood of animals, or the offering of grain. The tithe is a legalistic doctrine and stand against the simple New Covenant teaching that ministry is a gift given unto every one of us. It singles out one person who is "the minister" and therefore limits the move of God in our churches..
Tithing---what does the Bible say?--really!..........x349.............The tithe was the 1/10 of Israel's herd and crop that God considered as Holy unto Him. It was Holy for the purpose of being made an offering for sin. It was also used to pay the Levites--the priest of the Old Covenant, who had a full-time ministry, preparing the meat and bread and making the daily offerings properly. It was all necessary in order to forgive sin. In the New Covenant we have a better sacrifice--the blood of Jesus. In the New Testament, there simply was no tithe--all the giving of money and possessions was Spirit-lead--and to the poor--to those who had lack--NOT to a special group of people who were priests--instead all Christians were considered to be priests unto God--they all understood they had a ministry to fulfill for the Lord--and did not need to make sacrificial offerings of meat and bread and the blood of animals---the tithe. Titles of distinction?..........x350..........Very powerful tradition in the Christian church says that some people among us have titles of ministry which bear authority over others. But the Bible shows us plainly that ministry is a function--an operation--an anointing--NOT a title of rulership. Yes ministry has authority--the authority to teach the Gospel (to rule over sin)--to heal the sick (to rule over all manner of sickness and disease) and to cast out the devil (to rule over the enemy and his strongholds)--but specifically NOT authority one over another amongst ourselves..
Disciples to Apostles (the training method of Jesus)........x352........Jesus taught people, healed them, delivered them from their afflictions, and preached to them the Gospel of the coming kingdom. But then He did one final thing--He released them freely to serve God, He made them apostles--(people who are "set at liberty"--see Luke 4:18). The church is meant to operate exactly the way the Jesus did--to be His body in the earth. Why don't we want to operate the same way? It would be so much more fun!. What About the One-Sixtieth Offering?.....X109I....Tithe, tithe, tithe, lot's of folks like to preach the tithe at Christians. They make it seem as if the Bible has a law that says 1/10th of everything belongs to them! In Ezekiel, God asked Israel for a1/60th offering why don't we go by that rule? Undefined rule--the world doesn't want it Why is it in the church?.........x355.........Every denomination, and individual church is man's attempt to form a Godly government without God. We have an incredibly dangerous situation in the Christian church, and are divided into pieces, simply because we accept undefined rule within the church. Why can't we use Jesus definition of "them that have the rule"?. A TV Show That Does Better Ministry Than The Church....X109J..There is a TV show that gives a better example of what true ministry is than the traditional Christian church. And God does bigger miracles here than on Sunday. Under.......x356........Christians are experts at understanding what it means to be "under authority". We have been taught it is somehow vital to be "set under authority" in our church system. In the Bible there is only one person who says he is "set under authority"--the Roman centurion. He is describing the Roman form of government--the kingdom of the Gentiles--which as Jesus says, is all about one person exercising authority over the rest---NOT to be among ourselves!!. walk into Damascus.........x363..........How is it possible that Saul of Tarsus--the enemy of the church, could be converted, baptized, and begin preaching in a matter of days? Well, for one thing he went tot the right church--at Damascus they understood clearly that ministry was a gift "even to the rebellious". But for another, the sowing of the word of God (which is the definition of ministry) comes from incorruptible seed which always accomplishes it's purpose--and will bear fruit at the right time. Unfortunately, our church tradition with regard to ministry produces abundant rotten fruit. We are all evangelists.....x364.........If we simply define the word evangelist Biblically, it means "one who bears the Good News of salvation". The Bible tells us plainly that we are all called to be evangelists--this is a function--an operation--an anointing--NOT a title for only some Christians to bear (and how much better it would be if we worked together and turned our evangelism into apostleship!). Why don't people get saved when they walk into our church?.......x384..........Have you ever invited an unsaved person to Sunday meeting, hoping they would accept Christ--and nothing happened? they walked out just as unrepentant as they walked into church. Why? perhaps it is because of incorrect operation within our church format. The bible tells us that if all prophecy (NOT just the leadership--the pastor--the "altar ministers"), the unsaved are sure to be convicted of their sin and come to the Lord. Jesus--His Pastoral Ministry.....x39...........Do we ever consider Jesus ministry as the example of pastoral ministry? He said that he was the only true and right shepherd (pastor). do we ever consider His example of teaching with the purpose of release as the correct example of pastoral ministry? Or have we tainted pastoral ministry with a worldly system based upon money?. Gifts of the Holy Spirit.......x405...........The teaching that the gifts of the Holy Spirit--and their ministration--are unto "every man". Our "Spirit-lead" churches believe in this--the question is, do we operate the church by the instructions and command of the Holy Spirit--who will speak through "every man"? Doing the Opposite With Our Money...........x411.........In the Bible church, the money was freely given to anyone who had need. It supported the ministry of anyone who had need. The "church " which they were building consisted of people, not a large assembly hall. The building and operation of a building takes up most of our time effort and money in our church of today---Why?. The Church in Your House........x423............IN the Old Covenant, the "house of God" was the temple in Jerusalem. But the New Testament "house of God" is the home of nearly every Christian--the basis of which was Christian marriage. This is why the NT bible always relates, ministry, church operation and marriage! Mourning for the fornicator........x424.............There is a passage in the Bible, which taken out of context and translated by incorrect church operational concepts, seems to lead us to believe that church "authority" has the right to kick people out of the church. We ought to read the word more carefully--in its' own context--and thus receive a far greater message. The Haphazard Method of getting people saved........x199.............We in most of our churches have the plan of accidentally getting people saved. We "hope" that God will lead someone to us. Did you know that this is unscriptural? We are supposed to be "sent" (Greek; apostello) to the lost, not the other way around. The Bible method for reaching the lost is apostleship..
Jesus sent away the people.......x217............Scene: Jesus has just finished feeding the 5,000. He is leaving on a boat--and He makes the statement that He must "send away" the crowds. What was Jesus doing? Was He just "dissing" everybody--telling them "okay okay--shows over--everybody go home!" Nope. He was releasing them--He was granting one of His free gifts--the right to freely be released to serve God. John 17..........x231..............In this chapter of the Bible, the word "apostello" is used 7 times. Jesus is saying here that He was an apostle, He had sent out apostles and operated His ministry by apostleship, and, He also says that all of us are to be apostles--since this prayer of apostleship was not just to those people back then, but to "all those who believe on Jesus through the word of the apostles"---that's us!!. .e-mail to a pastor...........x232..........Just what is a pastor? Well, he's the guy who runs the church--right? Well, if we go by the firm tradition of Christianity for 1700 years--this is true--on the other hand, if we were to look at what the Bible says a pastor is--we come up with an entirely different answer. Likewise the Deacons......x241............1Timothy 3:1-15 are vital in understanding the operation of the church according to the Bible. But we must study these verse carefully and without our traditional interpretations based on our experience and the experience of previous church generations. These verses tell us that there are ministers who are not leaders--and they explain exactly where the "5-fold ministry" fits into the equation. Pastor--Priest--Roman system--all based on the Old Covenant......x509..........Hundreds of years ago, Roman emperors created the system and format for the Christian church--based upon the notion that they had "declared" everyone a Christian--and now were simply interested in teaching and controlling the people who were "under their authority". They used out-of-context verses from the old covenant to do this---here's how..
Jesus Teaching on money--and ministry.......x525......In Matthew chapter 6, Jesus delivers a simple teaching on money. He tells us plainly that we cannot serve God and money. These two things are at odds--they are in direct opposition to one another. If we minister and serve others freely, we will be avoiding the pitfall that the Lord is describing. It's the description of simple and pure ministry (probably all of us have done it at one time or another--it's great and completely effective!!!). But, where does our idea of church organization and operation come into this picture?. Christians: On Full--or empty..........x530............Have you ever read the Bible and realized--or at least had the inkling that they were doing things differently than we do? We have firm traditions about how "church" should look and work. Our system ignores that fact that release ("setting at liberty"--literally "apostolic freedom"--the freedom to operate in ministry) was intrinsic to Jesus' ministry--an important part and result of the Gospel itself. This study looks at some of the places where the church "needs some work"-!. Around the world--Again and Again!.....x531..........The airwaves are filled with "big-time" ministries--many of whom advertise that if you send them some money--they will finally fulfill the prophecy that the Gospel will be preached to all nations. Well, for almost 100 years the Gospel has been preached around the world by shortwave radio--so where's Jesus? Television signals have reached all the planets in our solar system--yet the Lord hasn't returned yet--right? Maybe we need to look carefully at the Gospel that Jesus proclaimed. Maybe it's the Gospel that we haven't fulfilled--maybe all the tools we need are there--we just need to get the true full Gospel message right--the message that includes release-!. Watchers of ministry----How Jesus Dealt with It......x182...Jesus demanded that everyone who followed Him be a priest--that all His followers served God. In our system of church today we need the majority of people to be watchers and consumers of ministry--who is right--Jesus or us? 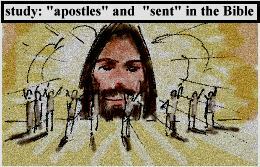 Apostles--someone who is sent--not a title to bear........x117......Apostolic ministry was Jesus' first concern and the same can be said of the early church. Just what is an apostle? Do we have a clear Biblical understanding of this most important Bible ministry?. Assembly and church--2 different things....x170.........We have tradition, whether we realize it or not--that has lumped together the concepts of the House of God--the church--and the assembling of ourselves together. Yet these things Biblically are different--they are not a weekly church service in one building --which we spend most of our time, effort, and money, operating. Collosians 2--body again!.........x154.......This section of the Bible speaks the same message found in Romans and Ephesians and Corinthians (and many other places as well). The fact that Christ is the Head of the church, all Christians are the church, and we ought to operate like His body in the earth--serving His will in every way on this common level from which we are to function. Victory and the Gifts--a quick overview........x188....The ministry gifts are God's plan for victory over sin -sickness- and -Satan. But over history, Satan has pulled out all stops to limit their use. Satan quotes out of context--Jesus puts it in context!.........x512.......When Satan tempted the Lord, he used out-of-context Bible verses, to get Jesus to act against God's will. Jesus' answer was to put the word in the context that God set it in. We ask you to always check any teaching -(including ours!) with full Bible context---and more deeply--are we really operating the church in the correct Biblical context?. Judas had a ministry!..........x173......Ministry is simply service--and everyone serves someone--whether we realize it or not. One can be a servant of Satan--or pose as a servant of God--Judas was a servant of God who sold out to the devil--but he was still a servant--we all serve someone. Do we really want revival?.......x13........Written by Charles Finney many years ago, this study points to the lack of ministry within the system of the church as we operate it.